Way back when (ok, actually the first weekend of January, I suppose), my father came to visit (our first house guest in Casa G!) and to share a little post-Christmas-Christmas with us. And no visit to Roanoke, in my opinion, is complete without a hike & visit to a winery. 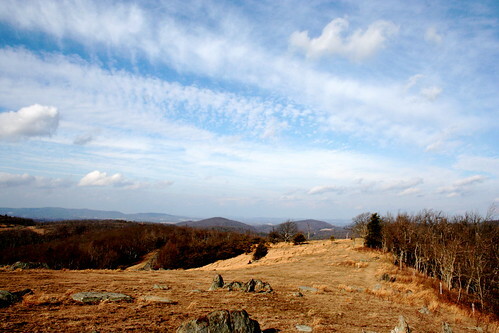 For the hike, we hit a short, yet pretty trail called Rocky Knob, which wound through some forested area with a creek and then spit us out in a cow pasture with some excellent views of the plateau. It was super windy, and therefore hard to get a good picture of us, but other than that, the weather and the hike itself were superb. I was in some pretty royal pain from doing a class at the YMCA the day before, so the easy, rolling hills were perfect for my sore legs and I found it pretty fun to traipse through a working pasture that someone owns (the owner is cool with the trail and it’s a pretty established hike with an easy to follow path, so no worries there). 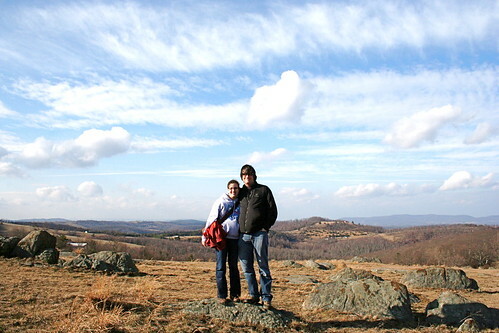 Thankfully, hikes in Virginia, it seems, are always close to wineries, and Chateau Morrisette, our destination, wasn’t far away–just a few miles down the Blue Ridge Parkway. 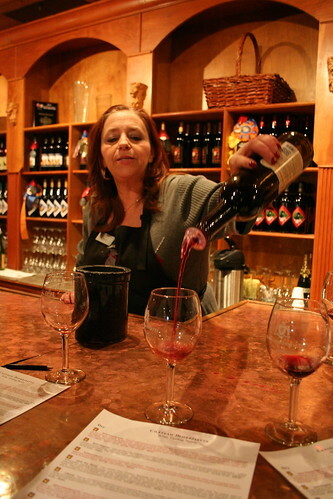 I’ve always like Chateau Morrisette’s wines–I think they’re solidly good–but, even though I regularly buy them in stores around town and drink them at wine festivals, I’d never been to the winery. 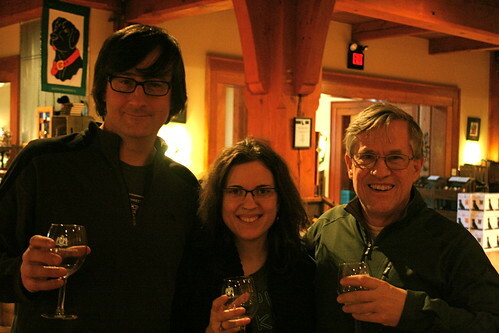 And, coincidentally, it was also my father’s first ever wine tasting! G, having been to many tastings (we regularly hit wineries up) and many tastings at Chateau Morrisette, even, didn’t seem to mind too much, and our tasting was with a fun group of folks with a friendly pourer, so that made it all the better. I, per usual, loved the assortment we tried (though I lean towards the fuller bodied reds and crisp, dry whites, personally) and my father seemed to really enjoy himself (something I wasn’t so sure about, but, heck, he lived in Chile for a year and that’s a world player in the global wine making scene). The winery is the most, according to G, Napa-ish of the ones I’ve ever seen in Virginia–it’s bigger than all the ones I’ve been to and, because it produces so much wine and is carried in most Krogers and even the Sam’s Club here, it has a lot of money to put into the wine tasting room and the property. After the hike, it felt like a retreat into a lush, warm French mansion, especially with the big fire place roaring and with all the friendly bottles of wine begging to be tasted. And I’ve heard their food is superb, something I’ll have to check out sometime soon. With all the wine and the hiking, though, we were famished, and decided to drive back down the mountain into town to get a bite to eat. Exhausted, we debated a few places, but finally settled one of the newer Vietnamese restaurants now in town–Pho Saigon. I plan on doing a more in-depth review in the future, but, as far as it goes, Pho Saigon blew me away on this first visit. The best Vietnamese food I’ve ever had? Nah, but really damn tasty. 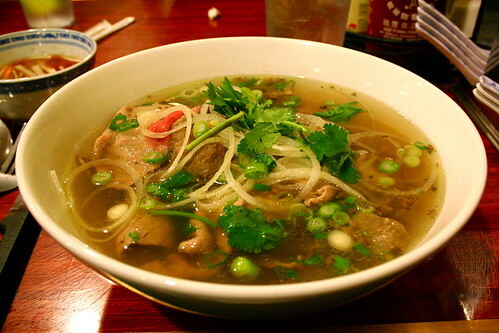 G ordered the Pho with eye round steak, flank, fatty flank, and meatballs. The broth was rich and flavorful and the pho featured the perfect amount of meat–not a crazy, American-sized portion, but a good tasting of all of the different meats. The meatballs were my favorite–chewy and spiced nicely with some of the more aromatic herbs that I can never pick out (as of yet, at least)–they complimented the broth perfectly. 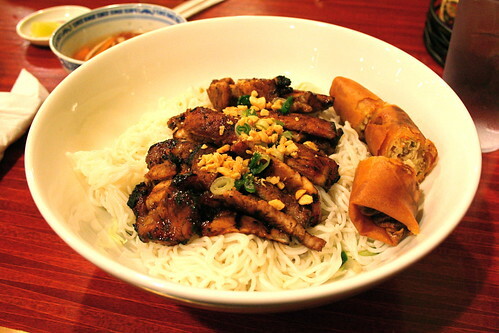 As for my dish, I settled on the Bun Cha Gio, Thit Nuong–charbroiled pork with egg roll. The charbroiled pork bun is the thing of my cravings–in Atlanta, before I was vegan (obviously), I used to eat at several Vietnamese restaurants in high school, and I always ordered charbroiled pork bun, but with this egg pancake thing that was unbelievably good and which I can’t ever find in other restaurants I eat at. Pfft. Anyways, the best park about it for me was the sweet, slightly charred pork served with the noodles and the sauce that you pour on top. Pho Saigon’s bun hit that spot for me–slightly charred and crispy meat with a slightly sweet yet savory sauce. There’s a vegetarian bun on the menu that I can’t wait to go back and try, so wait for my thoughts on that in the coming months! Sated, we rolled back home and watched the Lions lose horrifically to New Orleans. Not the perfect ending to a pretty much perfect day, but you win some, you lose some. And I’ll stick with our wins. I haven’t had good Vietnamese food in years…decades? Jeez. That needs to change. There aren’t any Vietnamese restaurants here, though, and I’m betting I would only be disappointment with anything I could cobble together. Cody’s good friend lives in Vietnam so maybe I’ll have to just go straight to the source! It looks like you enjoyed a great time with your Papa. How cool that he was your first houseguest! And I love the way you described the charred pork – it sounds incredible! That first photo is gorgeous. I want to go to there! We ate at Pho Saigon Wednesday night (2/15). It was great!!!! We all had Chicken Pho and Spring rolls. We will list this as a favorite!!! and be repeaters!! 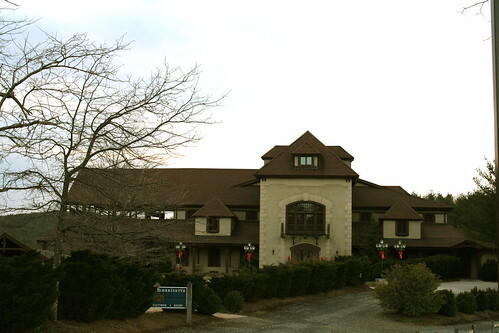 We also have been to the winery and that is a very nice place too!! !